David T.W. Wong, D.M.D., D.M.Sc. is the Felix and Mildred Yip Endowed Chair in Dentistry and a Professor in the Section of Oral Biology in the Division of Oral Biology and Medicine. He is the Associate Dean of Research and the Director of the UCLA Center for Oral/Head and Neck Research. He is an active scientist in oral cancer and saliva diagnostics research. He has authored over 230 peer reviewed scientific publications. He is a fellow of the American Association for the Advancement of Sciences (AAAS), past member of the ADA Council of Scientific Affairs and the past president of American Association of Dental Research (AADR). Dr. Wong’s Lab website. My laboratory currently has three research directions in head and neck cancer research: Discoveries, Pathogenesis and a Translational portfolio of oral fluid-based molecular diagnostics. Discoveries: My laboratory spearheads the use of genome-wide and proteome-wide high-throughput technologies to harness the diagnostic and biological determinants pertaining to the pathogenesis of oral/head and neck cancer. In particular we are focusing on the genomic and proteomic determinants of oral cancer progression. Using a patient-based genome/proteome-wide approach; we are harnessing the genomic and proteomic determinants that distinguish progressing from non-progression oral precancers. For genomic defects, a concurrent approach to identify gene copy number abnormalities (CNA) by cDNA microarray comparative genomic hybridization (CGH) as well as SNP-based loss of heterozygosity (LOH) using the Affymetrix 100K SNP-based Mapping Arrays. For expression analysis, the Affymetrix 133+ 2 and all exon high-density oligonucleotide arrays are used. For proteomic analysis, LC-MS/MS as well as single cell proteomics are creatively being integrated. A key component to a systems approach (Weighted-Gene Co-Expression Network Analysis, WGCNA) is to seek out molecular concordance of detectable molecular defects. A cellular gene has to exhibit molecular congruency at the genomic, mRNA expression as well as proteomic levels to qualify as a potential molecular marker. All of these approaches use patient-based materials and laser capture microdissection (LCM) is used to selectively procure homogeneous cell types from tissue sections to minimize contamination by non-relevant cell types in these sensitive molecular analyses. Pathogenesis: We subscribe to the belief that a central defect in human cancer lies in the dysregulation of cell cycle control. Both establishing a molecular database of cell cycle regulatory genes dysregulated in head and neck cancer and understanding the molecular and biochemical pathways of these genes are areas of prime interest. Using differential expression screening assays we have identified a number of cellular genes that are differentially expressed in squamous cell carcinoma. CDK2-AP1 is a differentially expressed cellular gene that is currently being studied. CDK2-AP1 is a novel gene exhibiting growth suppressor properties. CDK2-AP1 exerts its growth suppressor function by negatively regulating the activities of DNA polymerase-a/primase and cyclin-dependent kinase 2 (CDK2). CDK2-AP1 associates with DNA polymerase-a/primase suppressing DNA replication, affecting predominantly the initiation step. CDK2-AP1 has been found to associates with the monomeric non-phosphorylated form of CDK2, suppressing CDK2-associated kinase activities and cell cycle progression. CDK2-AP1 also targets CDK2 for proteolysis. Currently we are investigating the detailed biochemical and genetic mechanisms of CDK2-AP1 in cell cycle regulation, normal development and carcinogenesis. 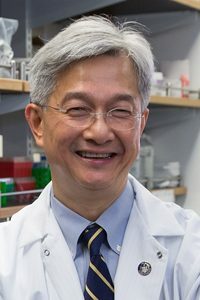 The most recent excitement of this research includes finding that CDK2-AP1 -nulled mice are embryonically lethal and that CDK2-AP1 is an epigenetic regulator for differentiation competency for mouse embryonic stem cells, placing this gene at a pivotal juncture of stem cell differentiation and development. Molecular Diagnostics: The ability to monitor for the early detection of cancer by non-invasive means has been the holy grail for cancer researchers. However, progress towards this goal has not met expectations. My research group, with the support from NIDCR and NIH, has initiated a series of concerted efforts to spearhead the scientific and translational frontiers of salivary diagnostics. The potential use of saliva, a totally non-invasive biofluid, for oral and systemic disease detection, for disease progression, and for therapeutic monitoring are highly desirable goals. We have harnessed and defined five diagnostic alphabets from human saliva. In addition to the salivary proteome and salivary transcriptome, we have deciphered and defined the salivary micro-RNA, metabolome and microbiome. The availability of these diagnostic alphabets greatly enhanced the translational utility of saliva. In parallel to the biomarker efforts, we have been developing point-of-care technologies for using saliva for clinical diagnostics applications. The “Oral Fluid NanoSensor Test (OFNASET)” is a prototype nanotechnology point-of-care sensor that will have the ability to detect multiplex analytes in saliva for disease detection. The concurrent biomarker and technology development initiatives at UCLA led to the establishment of the “UCLA Collaborative Oral Fluid Diagnostics Research Center” to fully explore the scientific, translational and clinical frontiers of salivary diagnostics and salivary pharmacogenomics. The utilization of saliva for personalized individual medicine applications is only footsteps away. Deshpande, A M, Khalid, O, Kim, J J, Kim, Y, Lindgren, A, Clark, A T, and Wong, D T Cdk2ap2 is a novel regulator for self-renewal of murine embryonic stem cells. Stem Cells Dev, 2012; 21: 3010-3018. PMCID: 3475145. Kim, J J, Khalid, O, Vo, S, Sun, H H, Wong, D T, and Kim, Y A novel regulatory factor recruits the nucleosome remodeling complex to wingless integrated (wnt) signaling gene promoters in mouse embryonic stem cells. J Biol Chem, 2012; 287: 41103-41117. PMCID: 3510811. Spielmann, N, Ilsley, D, Gu, J, Lea, K, Brockman, J, Heater, S, Setterquist, R, and Wong, D T The human salivary RNA transcriptome revealed by massively parallel sequencing. Clin Chem, 2012; 58: 1314-1321. Zhang, L, Farrell, J J, Zhou, H, Elashoff, D, Akin, D, Park, N H, Chia, D, and Wong, D T Salivary Transcriptomic Biomarkers for Detection of Resectable Pancreatic Cancer. Gastroenterology, 2010; 138: 949-957 e947. PMCID: PMC2831159. Matse, J H, Yoshizawa, J, Wang, X, Elashoff, D, Bolsher, J G, Veerman, E C, Bloemena, E, and Wong, D T Discovery and pre-validation of salivary extracellular microRNA biomarkers panel for the non-invasive detection of benign and malignant parotid gland tumors. Clin Cancer Res, 2013, in press.